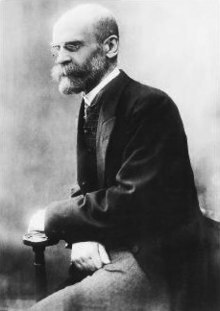 David Émile Durkheim (15 Mis Ebrel, 1858 - 15 Mis Du 15, 1917) o socyologydh ha filosofer Frynk. Gans Karl Marx ha Max Weber, Durkheim yw aswonnys ha tas-fondya a Socyologieth. Dres oll, Durkheim a vynnis dhe gonvedhes fatell kemenethow a wra sostena aga honan y'n oos arnowydh; oos may ma disliwys an kevrennow hengovek ha kryjyk hag oos may ma lies kresen socyal nowydh. Y kynsa ober socyologiethek brassa o The Division of Labour in Society (1893). Yn 1895, ev a wrug dyllo The rules of Sociological Method ha fondya an kynsa asran a socyologieth yn Europa ha dheuth ha bos an kynsa profesor a socyologyieth yn pow Frynk. Ev a fondyas an jornal L'Année Sociologique yn 1898. Yn 1897 Suicide a veu dyllys. Yn Suicide, Durkheim a wrug hwithra niverans omladhans yn kemeneth Katholik ha protestant. An ober ma eth ha bos an fondyans a hwithrans socyal arnowydh. Yn 1912, The Elementary Forms of the Religious Life a veu dyllys. Ynno, Durkheim a wrug ri y tybieth a kryjyans. Diwettha chanj an folen ma a veu an 9 Est 2016, dhe 15:24.